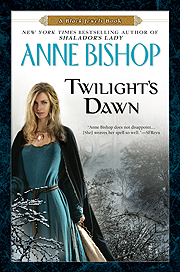 I wrote the following essays about the stories in Twilight’s Dawn. Like most things written about this book, they do contain some spoilers. The SaDiablo family has been part of my life for the past 20 years. During that time, I recorded Daemon’s and Lucivar’s transition from tormented slaves to warriors serving their beloved Queen to being the dominant males in Kaeleer. As the stories progressed, they became men who have firm control over the lands they rule—and a much more slippery hold on the women in their lives. I watched Saetan, family patriarch and High Lord of Hell, stumble through the challenges of being a single parent. And I followed Jaenelle as she changed from haunted child to powerful queen. All of those personal changes kept me coming back to these characters and the Black Jewels world, visiting them from time to time to share their lives again. With the stories in Twilight’s Dawn, the SaDiablos have told me it’s time to let go. Some of the questions readers have been asking since the Black Jewels Trilogy was first published have been answered. Other questions may always remain a mystery for all of us—and that’s as it should be. Sometimes the veil that keeps a character from being fully revealed is as important to our enjoyment of a story as the things we are allowed to see. Does that mean these are the last Black Jewels stories? No, I don’t think so. But the lives of the SaDiablo family have changed, and experience has taught me that it is better to let a place and a people rest for a while before exploring the next set of stories. So I’m gathering up my notes and tucking them away until I return to the Black Jewels world again to visit these long-time friends. In the meantime, I’m writing a story set in Ephemera, and may even explore a new world that has been beckoning lately. Letting go. It’s not forever. And when I return to the Realms, I’m sure the SaDiablo family and their friends will have more stories to tell. When I begin a story, I make a promise to the characters that I will accept them for who and what they are, without judgment, and I will write their story as honestly as I can. Sometimes it hurts to keep that promise. Sometimes it’s hard to see the scope of a story and realize that a character I like is going to end up with a life she finds satisfying, but it’s still less than what I’d hoped she would have. Or that a character is going to be gone, and the weight of that truth will be carried by the others and felt on every page. I may not always like where the characters are going or the choices they make, but I know when a story—and an ending—feels right. As the release date for Twilight’s Dawn approaches, I’ve had an epiphany. Or, perhaps, I’m simply ready to accept what I’ve known from the moment I wrote the first sentence. I write dark fantasy, and the Blood have never promised a happy ending. Not to anyone, including me. Maybe especially me. These stories have spiraled back to their dark, gritty beginnings. They are full of joy and pain, rage and celebration. They remind us that the stories about the SaDiablo family were about honor and passion and the price that is paid for a dream. They remind us that not everyone gets happy ever after—and not everyone survives. I don’t choose the stories. I never have. Like the statue hidden in a block of marble waiting for the sculptor’s hand, my stories rise up and wait for me to discover their shape. If I want the characters to live and breathe and bleed on the page, I have to be willing to tell their story honestly—and to take the heart bruises that sometimes go with the telling. It’s what I’ve always done; it’s what I’ll always do because it’s part of the journey I take with the Muse--and with Story. As you read Twilight’s Dawn, I’ll remind you of what Daemon or Lucivar or the High Lord would have told you about the stories: Everything has a price. Queen of the Darkness was first published in 2000. Since that time, readers have been asking this question: What will happen to Daemon when Jaenelle is gone? For most of those years, my answer was “I don’t know. It’s too far beyond where I am in their storytime.” Daemon and Jaenelle were together and happy and, for me, that was enough. But the question was there, drifting under the surface as I wrote other Black Jewels books. Stories are about conflict. They’re about a problem to be solved, or a race against time to save whoever or whatever needs saving, or the sometimes quiet struggle that arises when people have opposing hopes and dreams. They’re about the clash that shakes a fictional world in some way. When readers pick up a book, they join the characters on that journey, watching them make choices, both good and bad, watching them stumble and try again as the stakes get higher and higher until, finally, the heroes of the story succeed. Or fail. In a story with a positive ending, the hero wins his heart’s desire or at least has the chance of finding it. Most often, the reward is a settled life that can be enjoyed. Happy ever after is where stories end. By the time I was working on The Shadow Queen, I had a sense of where the SaDiablo family would be in a decade or two. I began to think about Sylvia and Surreal, as well as Daemon and Jaenelle. And answers to the questions that had drifted under the surface began to form. Recently, someone made the comment that she never thought this story about Daemon would be written. I didn’t think it would be either. But when I looked at Daemon and Jaenelle and the life they had together, I realized this was the next story in their journey, and it was time to write that story. As I followed Daemon’s efforts to deal with this stage of his life, I discovered the laughter as well as the tears, the joy as well as the sorrow. I discovered the echoes of the past in the present—and the gifts left behind by an extraordinary Queen. Stories aren’t chained to the present. I don’t know the when of the next Black Jewels stories or whom they will be about. I have asked the questions and set them adrift. When the stories are ready to be told, the answers will rise to the surface. In the meantime, I’ll remember Daemon and Jaenelle’s extraordinary ordinary life together and wait for the next journey.